The UN mission in Western Sahara (MINURSO) has dealt a blow to the Polisario’s chief, Brahim Ghali, when it affirmed that contrary to Ghali’s allegations, it had not witnessed any suspicious military movement by Morocco in the southwest of the Sahara. In his response to the protest letter Ghali had addressed to the UN Secretary General Ban Ki-Moon, wherein he alleged that Morocco had violated the cease-fire, Deputy Spokesperson for Ban Ki-moon, Farhan Haq, set the record straight. He actually assured that “on 16 and 17 August, the MINURSO deployed ground and air capabilities to investigate allegations of violations in the southwestern part of Western Sahara near Mauritania.” “MINURSO has not observed military presence or equipment in the buffer strip. The Mission observed what were assessed as civilian vehicles moving across the berm,” he affirmed. The operation aims at dislodging all sorts of smugglers and traffickers active in the extreme southwestern part of Morocco. 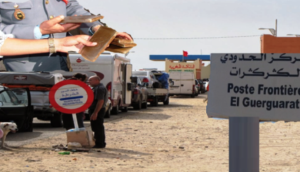 For Rabat, the operation, conducted since Sunday August 14 by Moroccan security services and customs authorities in the area bordering on Mauritania, is merely meant to fight smuggling and illicit trade activities. Moroccan authorities have stated in communiqués that they have dismantled “three meeting points where used cars and car and truck bodies are illegally sold” and seized 600 unregistered vehicles. In his letter to Ban Ki-Moon, the leader of the separatist front claims that Morocco had mobilized military units and accuses the kingdom of being behind a “systematic escalation” in Western Sahara. It is in this context and out of concern to see this area becoming a safe haven for the armed terrorist groups roaming in the Sahel that Moroccan authorities conducted this large-scale clearing operation.